Can You Use Butter Instead of Cooking Oil for Cupcakes? A woman is cooking cupcakes. 1 How Many Calories in Applesauce? 2 Can You Use Butter Instead of Cooking Oil for Cupcakes? Making healthier food choices can lead to a healthier lifestyle. Applesauce is a healthier option than oil, and may be substituted when you are baking. Substitute applesauce for oil by cutting the amount of oil recommended by two-thirds and replace with applesauce. For example, if a recipe calls for 1½ cups of oil, substitute 1 cup of applesauce and use ½ cup of oil. 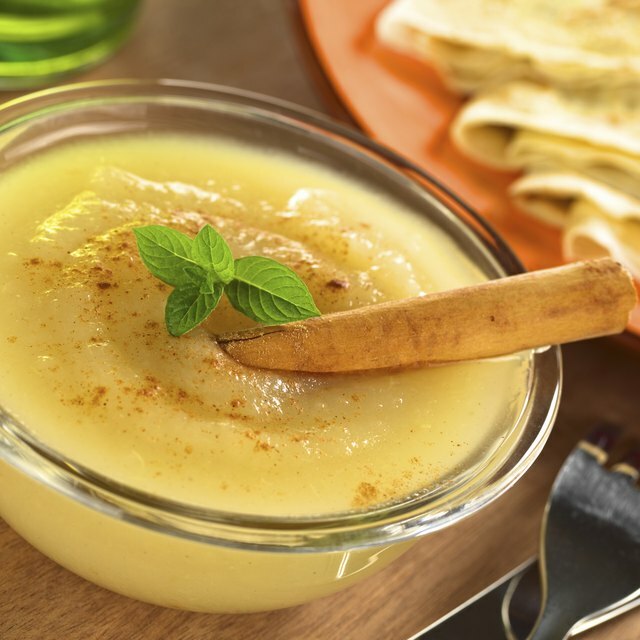 Applesauce, derived from apples, is low in sodium and fat. A 4 oz. serving of unsweetened applesauce contains 1 g of fiber, 2 mg of vitamin C and no fat. Unsweetened applesauce is a more healthful alternative than sweetened applesauce. Sweetened applesauce contains more calories and .5 g of fat. Read the food labels before purchasing applesauce to ensure fructose corn syrup has not been added. Vegetable oil contains more fat than applesauce. A 7.7 oz. or 1 tbsp. serving of vegetable oil contains 13.6 g of fat. Replacing vegetable oil with other ingredients is especially helpful for diabetics; individuals with diabetes should eat a low-fat diet and limit polyunsaturated fat, such as the fat found in vegetable oils like olive, sunflower and sunflower oils. Applesauce does not have a strong taste or color that changes the product you are baking, so substituting applesauce for oil does not have to jeopardize the taste of the final baking product. In cupcakes, oil is used because it contains a high fat content, which adds moisture and tenderness. Fruit purees such as applesauce can add the same moisture content to cupcakes without the fat. Cupcakes is a perfect food for substituting applesauce for oil, since most recipes for baking cupcakes recommend oil in liquid form. Vegetable oil does not contribute significantly to the fluffiness of the baked product, as butter, a solid form of oil, does. Can You Substitute Vegetable Shortening With Applesauce?